Northern Stage's new home opened three years ago this month. Three years ago this month, Northern Stage’s new home, the Barrette Center for the Arts, opened in White River Junction, VT. Housed within Barrette Center is the intimate Jack & Dorothy Byrne Theater. The Byrne is a beautiful, intimate 240-seat modified thrust space featuring a steep seating rake (there is not a bad seat in that house!) and industrial “factory” theming throughout the building. As you can see, the Byrne Theater has a SkyDeck. The grid, composed of 47 modular panels, mirrors the shape of the modified thrust stage. While most of the panels are square or rectangular, four of them are triangular and four are trapezoidal to follow the curve of the downstage playing area. 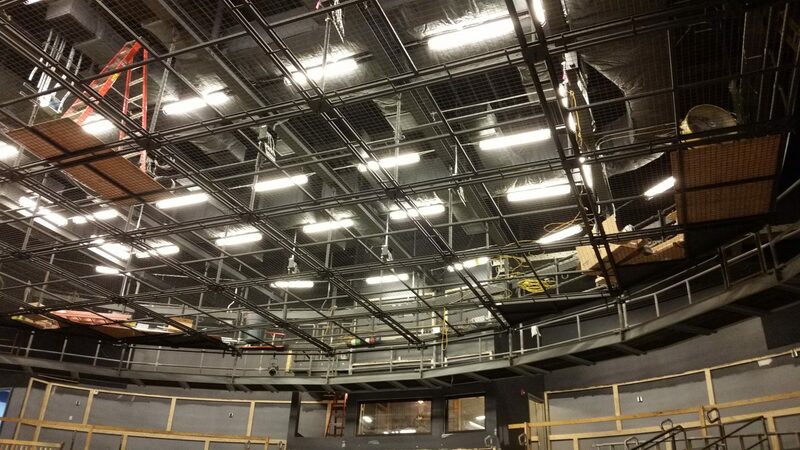 We wanted to touch base with Northern Stage to see how things were going in the new space. Matthew Mills, Associate Production Manager/Technical Director, had some great feedback. That kind of tight scheduling is typical for live theatre productions, especially during tech week. Think about it. You can’t hang lights at the same time the set’s going in, can you? 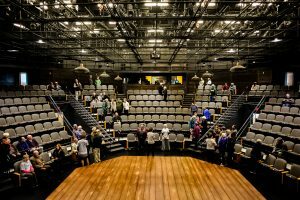 Northern Stage produces six full length productions per season plus special events, so you can see how safely combining work calls would be advantageous. I had to look into Mills’ next statement, “Another great part of the grid system is the moveable I-beams. We use the I-beams for every show, allowing us to rig items [through] the grid where otherwise there is nothing above the stage.” What now? 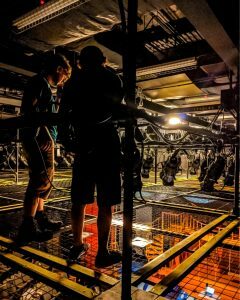 The moveable I-beams Mills is referring to are actually a super-cool accessory specified by Theatre Projects Consultants for venues with SkyDecks. These are demountable (moveable) aluminum lift bars that are made to go between a facility’s existing steel beams and they do exactly what Mills says: provide additional rigging points practically anywhere above the stage. They work beautifully with SkyDeck’s gridwells – the open spaces you see between the grid panels – pictured on the right. Northern Stage is a regional non-profit LORT-D professional theater company located in White River Junction, VT. Northern Stage actively engages its audiences with world-class productions and extensive educational and outreach programs in its new home, the Barrette Center for the Arts. Founded in 1997, the company has offered more than 150 professional productions of new works, classics, and musicals. Now it its 22nd Season, Northern Stage serves over 50,000 people.